In October 2016, the new IATF 16949:2016 standard was published. It supersedes the ISO/TS 16949 standard, which has been the effective global quality standard in the automotive industry so far. Since January 2017, companies have had the option of becoming certified in accordance with the new standard. Both F. Morat (November 2017) and Framo Morat (January 2018) have successfully completed the conversion to the new standard. By granting the certificate, DQS (The Audit Company, or the “Deutsche Gesellschaft zur Zertifizierung von Managementsystemen”) confirms that the companies of the Franz Morat Group have successfully implemented a quality management system based on the QMS-standards of the Automotive industry. The objective of IATF 16949 is to improve the quality of systems and processes for companies of the automotive industry. This continuous improvement process is crucial for the success of the international automotive industry. The process is intended to increase customer satisfaction, detect deficiencies and risks in the production process and supply chain, eliminate their causes and check the respective measures for effectiveness. IATF 16949 is based on the requirements of the ISO 9001 standard. 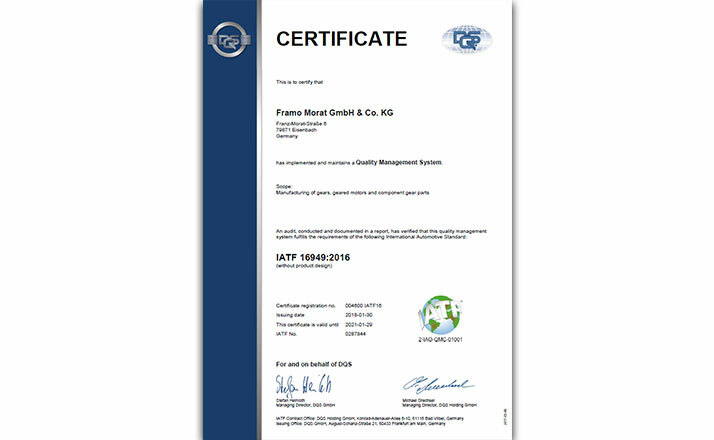 Both Framo Morat and F. Morat have been certified in accordance with ISO 9001 since the mid-1990s. It is not just customers from the automotive industry that will benefit from our certification in accordance with IATF 16949. Rather, these certification guidelines support a customer-oriented company like the Franz Morat Group – both in dealing with rising demands on product quality, productivity and competitiveness even more efficiently, and with increasing economical potential with respect to any and all customers.